In spring, a woman’s thoughts turn to Orange. And flowers. But mostly Orange. Winter is outrageously long. Something really should be done about that – perhaps a strongly-worded letter to Mother Nature? I'm out of ideas. Once winter starts loosening its hold, then come the massive amounts of rain, followed shortly after by earthworms popping up all over the pavement. Why IS that, anyway? So they don't drown in the soil? I don't see how crawling onto the pavement helps. There are puddles all over the place, also drowning hazards, plus people walking on them, squishing out their little wormy lives. Logic must not be a strong suit with earthworms. Who'd have thought? I wouldn't be surprised to find my bulbs have started rearing their heads. The weather's been mild enough (temperatures reached as high as the low 60s last week! ), and with the sun and rain they've probably gotten the signal it's time to awaken from their slumber. The weather's still cool enough to keep me inside, giving me the excuse to indulge my latest mania - reading my way through the Orange Prize longlist, in addition to books for review. I also have the NBCC winners – the ones I've chosen from the list. But it's the Orange Prize books that are at the top of the pile right now. I'm playing, "Guess which books make the shortlist." Really an exercise of most interest to myself, of course, but should I choose the winner I will make a point of proclaiming the fact loudly. "There aren't many roads out of town, which explains why so few people ever leave." The young woman, never named, is deeply in love with a man named Jude, fourteen years older than she is. He's been off to war in Iraq when the story starts, returning a changed and quiet man. She'd fallen in love before he left, sending him letters while he was away, though, unfortunately for her he'd already decided she was far too young for him. That didn't keep him from continuing to see her, on a friendship basis. He enjoyed her company while realizing full well her love for him was all-consuming. "She doesn't have much interest in men because she is still in love with my father even though he has been gone for eleven years." "These are the parts of him I find impossible to cut myself loose from. They are beautiful qualities. But beauty is heavy, and though I'm young I am getting tired from carrying around the bits and shreds of my father's beauty." Pain is everywhere in this novel. And while it may sound as though this book is too sad to bear, at the same time it's too beautiful for words. Nothing I can say about it does it justice; my comments are but a pale reflection of the original. The ending I found shocking. I've read some books that have blindsided me, but that isn't the norm. Once I finished I realized it had come full circle, the ending expanding on the otherwise puzzling beginning, making sense only in retrospect. Even then, it's a strange ending, one impossible to guess. 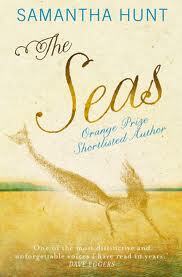 In a way the book reminds me of Jane Urquhart's novel Away, impossible love set in a seafaring location. If you feel – as I do – Wuthering Heights is a romantic novel, you'll probably love The Seas. So much about these books is similar, enough I have to wonder how much influence Brontë's book had on Hunt's. They feel so alike. These gloomy, rainy days are well suited to reading The Seas. Sadness, love without hope, intensity of emotion. The combination is perfect. Again, I can't over-emphasize this book's beauty. The prose dazzles. If this book doesn't make the shortlist I'll be furious. And, speaking of strongly-worded letters, the Orange Prize will definitely hear from me if they don't choose it for the next round. "Don't forget that the ocean is full of everything except mercy." Lovely review and a tempting lovely book. I wasn’t sure this is one I would try and read, but now I think I will indeed check it out from the library. Thanks. And I love Wuthering Heights, too! Previous Post Love when publishers do this!